The one thought I cannot purge, the one that keeps coming back and getting between me and my bliss, is this: What a waste of time. I am sitting cross-legged on a purple cushion with my eyes closed in a yoga studio with 40 people, most of them attractive women in workout outfits, and it is accomplishment enough that I am not thinking about them. Or giggling. I have concentrated on the sounds outside and then on my breath and then, supposedly, just on the present reality of my physical state—a physical state concerned increasingly with the lack of blood in my right foot. But I let that pass, and then I let my thoughts of the hot women go, and then the future and the past, and then my worries about how best to write this article and, for just a few moments, I hit it. It looks like infinite blackness, feels like a separation from my body and seems like the moment right before you fall asleep, only I'm completely awake. It is kind of nice. And then, immediately, I have this epiphany: I could be watching television. After 20 minutes we stop for a break, which surprises me, since I would not have guessed that sitting on a cushion is an activity that requires a break. Before we begin again, our instructor, Sharon Salzberg, a cofounder of the Insight Meditation Society in Barre, Mass., and the author of Faith: Trusting Your Own Deepest Experience, asks for questions or comments. Four are about breathing. "Breathing is too complicated for me to concentrate on," one woman complains. "I mean, breathing must be the most complex thing we do." I briefly consider waiting outside and mugging the lot of them. But as pitiably muggable as these people may appear, the latest science says they've got something on my judgmental self. For one thing, they will probably outlive me by quite a few years. Not only do studies show that meditation is boosting their immune system, but brain scans suggest that it may be rewiring their brains to reduce stress. Meanwhile, we nonbelievers are becoming the minority. Ten million American adults now say they practice some form of meditation regularly, twice as many as a decade ago. Meditation classes today are being filled by mainstream Americans who don't own crystals, don't subscribe to New Age magazines and don't even reside in Los Angeles. For upwardly mobile professionals convinced that their lives are more stressful than those of the cow-milking, soapmaking, butter-churning generations that preceded them, meditation is the smart person's bubble bath. And they no longer have to go off to some bearded guru in the woods to do it. In fact, it's becoming increasingly hard to avoid meditation. It's offered in schools, hospitals, law firms, government buildings, corporate offices and prisons. There are specially marked meditation rooms in airports alongside the prayer chapels and Internet kiosks. Meditation was the subject of a course at West Point, the spring 2002 issue of the Harvard Law Review and a few too many locker-room speeches by Lakers coach Phil Jackson. At the Maharishi University schools in Fairfield, Iowa, which include college, high school and elementary classes, the entire elementary school student body meditates together twice daily. The Shambhala Mountain Center in the Colorado Rockies, a sprawling, gilded campus that looks like casino magnate Steve Wynn's take on Tibet, has gone from 1,342 visitors in 1998 to a projected 15,000 this year. The Catskills hotels in New York are turning into meditation retreats so quickly that the Borscht Belt is being renamed the Buddhist Belt. And, as with any great American trend that finds its way onto the cover of TIME, many of these meditators are famous. To name just a few: Goldie Hawn, Shania Twain, Heather Graham, Richard Gere and Al Gore, if he still counts as famous. But the current interest is as much medical as it is cultural. Meditation is being recommended by more and more physicians as a way to prevent, slow or at least control the pain of chronic diseases like heart conditions, AIDS, cancer and infertility. It is also being used to restore balance in the face of such psychiatric disturbances as depression, hyperactivity and attention-deficit disorder (ADD). In a confluence of Eastern mysticism and Western science, doctors are embracing meditation not because they think it's hip or cool but because scientific studies are beginning to show that it works, particularly for stress-related conditions. "For 30 years meditation research has told us that it works beautifully as an antidote to stress," says Daniel Goleman, author of Destructive Emotions, a conversation among the Dalai Lama and a group of neuroscientists. "But what's exciting about the new research is how meditation can train the mind and reshape the brain." Tests using the most sophisticated imaging techniques suggest that it can actually reset the brain, changing the point at which a traffic jam, for instance, sets the blood boiling. Plus, compared with surgery, sitting on a cushion is really cheap. As meditation is demystified and mainstreamed, the methods have become more streamlined. There's less incense burning today, but there remains a nugget of Buddhist philosophy: the belief that by sitting in silence for 10 minutes to 40 minutes a day and actively concentrating on a breath or a word or an image, you can train yourself to focus on the present over the past and the future, transcending reality by fully accepting it. In its most modern, Americanized forms, it has dropped the creepy mantra bit that has you memorize a secret phrase or syllable; instead you focus on a sound or on your breathing. It's a practice of repetition found somewhere in the history of most religions. There are dozens of flavors, from the Relaxation Response to gtum-mo, a technique practiced by Tibetan monks in eight-hour sessions that allows them to drive their core body temperature high enough to overcome earthly defilements or—even cooler—to dry wet sheets on their backs in the freezing temperatures of the Himalayas. The brain, like the body, also undergoes subtle changes during deep meditation. The first scientific studies, in the '60s and '70s, basically proved that meditators are really, really focused. In India a researcher named B.K. Anand found that yogis could meditate themselves into trances so deep that they didn't react when hot test tubes were pressed against their arms. In Japan a scientist named T. Hirai showed that Zen meditators were so focused on the moment that they never habituated themselves to the sound of a ticking clock (most people eventually block out the noise, but the meditators kept hearing it for hours). Another study showed that master meditators, unlike marksmen, don't flinch at the sound of a gunshot. None of this, oddly, has been duplicated for a Vegas show. In 1967 Dr. Herbert Benson, a professor of medicine at Harvard Medical School, afraid of looking too flaky, waited until late at night to sneak 36 transcendental meditators into his lab to measure their heart rate, blood pressure, skin temperature and rectal temperature. He found that when they meditated, they used 17% less oxygen, lowered their heart rates by three beats a minute and increased their theta brain waves—the ones that appear right before sleep—without slipping into the brain-wave pattern of actual sleep. In his 1970s best seller, The Relaxation Response, Benson, who founded the Mind/Body Medical Institute, argued that meditators counteracted the stress-induced fight-or-flight response and achieved a calmer, happier state. "All I've done," says Benson, "is put a biological explanation on techniques that people have been utilizing for thousands of years." Several years later, Dr. Gregg Jacobs, a professor of psychiatry at Harvard Medical School who worked with Benson, recorded EEGs of one group of subjects taught to meditate and another given books on tape with which to chill out. Over the next few months, the meditators produced far more theta waves than the book listeners, essentially deactivating the frontal areas of the brain that receive and process sensory information. They also managed to lower activity in the parietal lobe, a section of the brain located near the top of the head that orients you in space and time. By shutting down the parietal lobe, you can lose your sense of boundaries and feel more "at one" with the universe, which probably feels a lot less boring than it sounds when you try to tell your friends about it. Studies of the meditating brain got much more sophisticated after brain imaging was discovered. Or maybe not. In 1997 University of Pennsylvania neurologist Andrew Newberg hooked up a group of Buddhist meditators to IVs containing a radioactive dye that he hoped would track blood flow in the brain, lighting up the parts that were the most active. But the only way for Newberg to freeze-frame the exact moment when they reached their meditative peak was to sit in the next room, tie a string around his finger and snake the other end under the door and leave it next to the meditators. When they reached meditative Nirvana, they pulled the string, and Newberg released the dye into the subjects' arms. His results showed that the brain doesn't shut off when it meditates but rather blocks information from coming into the parietal lobe. Meanwhile, Benson took a group of highly focused Sikhs who could meditate while an fMRI machine clanked away, and he measured the blood flow in their brains. Overall blood flow was down, but in certain areas, including the limbic system (which generates emotions and memories and regulates heart rate, respiratory rate and metabolism), it was up. At the University of Wisconsin at Madison, Richard Davidson has used brain imaging to show that meditation shifts activity in the prefrontal cortex (right behind our foreheads) from the right hemisphere to the left. Davidson's research suggests that by meditating regularly, the brain is reoriented from a stressful fight-or-flight mode to one of acceptance, a shift that increases contentment. People who have a negative disposition tend to be right-prefrontal oriented; left-prefrontals have more enthusiasms, more interests, relax more and tend to be happier, though perhaps with less real estate. Studies on meditation moved into the modern era in March 2000, when the Dalai Lama met with Western-trained psychologists and neuroscientists in Dharamsala, India, and urged the Mind and Life Institute to organize studies of highly accomplished meditation masters using the most advanced imaging technology, the results of which will be discussed in September at a conference at M.I.T. (which will also plan the next stages of research). Not only did these studies allow for a more detailed understanding of how the brain works during meditation, but they also provided a lot of cool shots of monks wearing electrodes. What scientists are discovering through these studies is that with enough practice, the neurons in the brain will adapt themselves to direct activity in that frontal, concentration-oriented area of the brain. It's what samurais and kamikaze pilots are trained to do and what Phil Jackson preaches: to learn to be totally aware of the moment. "Meditation is like gasoline," says Robert Thurman, director of the Tibet House (and father of actress Uma Thurman). "In Asia meditation was a sort of a natural tool anyone could use. We should detach it from just being Buddhist." Increasingly it is being detached from Buddhism. Along with the more obscure Zen techniques (such as sitting for hours in positions that look painful to me and asking to be hit with sticks if you feel you are about to doze off), Americans are trying Vipassana (which begins by focusing on your breath), walking meditation (at first walking really, really slowly and then being hyperaware of each step), Transcendental Meditation (or TM, repeating a Sanskrit syllable over and over), Dzogchen (cultivating a clear but even-keeled awareness) and even trance dance (spinning with a blindfold on for an hour to dance music). And early next year a new book, Eight Minutes That Will Change Your Life, by Victor Davich, will advocate the most American form of meditation yet: a daily practice that he claims takes just eight minutes. That, it turns out, is exactly how long we're conditioned by modern society to concentrate, since it's the amount of time between TV commercials. Josh Baran, author of the upcoming book 365 Nirvana Here and Now, says when his brain wanders in a distinctly unfocused, nonmeditative way—that deal when you've flipped five pages of a book and read nothing—it actually causes him discomfort. Roger Walsh, a professor of psychiatry, philosophy and anthropology at the University of California at Irvine, has been studying the extent to which meditators can control their psychological states. "Only in recent years has Western psychiatry recognized attention-deficit disorder, but the meditative-contemplative traditions have maintained for thousands of years that we all suffer from some kind of ADD and just don't recognize it." It's the kind of basic human attention deficit that makes it hard to keep reading a paragraph if it doesn't end with a joke. 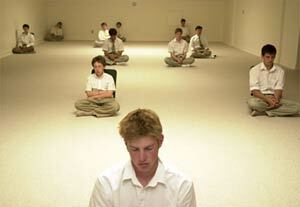 Psychologists are trying to discover whether meditation can reprogram minds with an antisocial bent. A study at the Kings County North Rehabilitation Facility, a jail near Seattle, asked prisoners serving time for nonviolent drug- or alcohol-related crimes to sit through Vipassana meditation for 10 days, 11 hours a day, alternating sitting and walking meditations. They were chosen for their extreme rehabilitation needs and because, really, who else are you going to get to bear with 11-hour meditation sessions? Approximately 56% of the newly enlightened prisoners returned to jail within two years, compared with a 75% recidivism rate among nonmeditators. The meditating cons also used fewer drugs, drank less and experienced less depression. At Cambridge University, John Teasdale found that mindfulness helped chronically depressed patients, reducing their relapse rate by half. Wendy Weisel, the daughter of two Holocaust survivors and author of Daughters of Absence, took anxiety medication for most of her life until she started meditating two years ago. "There's an astounding difference," she reports. "You don't need medication for depression or for tension. I'm on nothing for the first time in my life." Contentment and inner peace are nice, but think how many Americans would start meditating if you could convince them they would live longer without having to jog or eat broccoli rabe. More than a decade ago, Dr. Dean Ornish argued that meditation, along with yoga and dieting, reversed the buildup of plaque in coronary arteries. Last April, at a meeting of the American Urological Association, he announced his most recent findings that meditation may slow prostate cancer. While his results were interesting, it's important to note that those patients were also dieting and doing yoga. Jon Kabat-Zinn, who studied Buddhism in the '60s and founded the Stress Reduction Clinic at the UMass Medical Center in 1979, has been trying to find a more scientific demonstration of the healing power of meditation. Over the years, he has helped more than 14,000 people manage their pain without medication by teaching them to focus on what their pain feels like and accept it rather than fight it. "These people have cancer, AIDS, chronic pain," he says. "If we think we can do something for them, we're in deep trouble. But if you switch frames of reference and entertain the notion that they may be able to do something for themselves if we put very powerful tools at their disposal, things shift extraordinarily." Lately Kabat-Zinn has been studying a group of patients with psoriasis, an incurable skin disease that is often treated by asking patients to go to a hospital, put goggles on and stand naked in a hot, loud ultraviolet light box. Apparently, many people find this stressful. So Kabat-Zinn randomly picked half the patients and taught them to meditate in order to reduce their stress levels in the light box. In two experiments, the meditators' skin cleared up at four times the rate of the nonmeditators. In another study, conducted with Wisconsin's Richard Davidson, Kabat-Zinn gave a group of newly taught meditators and nonmeditators flu shots and measured the antibody levels in their blood. Researchers also measured their brain activity to see how much the meditators' mental activity shifted from the right brain to the left. Not only did the meditators have more antibodies at both four weeks and eight weeks after the shots, but the people whose activity shifted the most had even more antibodies. The better your meditation technique, Kabat-Zinn suggests, the healthier your immune system. Meanwhile, the evidence from meditation researchers continues to mount. One study, for example, shows that women who meditate and use guided imagery have higher levels of the immune cells known to combat tumors in the breast. This comes after many studies have established that meditation can significantly reduce blood pressure. Given that 60% of doctor visits are the result of stress-related conditions, this isn't surprising. Nor is it surprising that meditation can sometimes be used to replace Viagra. But meditation does more than reduce stress, bring harmony and increase focus. As the Beatles demonstrated in 1968 when they visited the Maharishi Mahesh Yogi in his Himalayan ashram (they had met him in London in 1967), it can also give you much needed gravitas. Actress Heather Graham started meditating at the suggestion of director David Lynch, another Maharishi student, 12 years ago on the set of his studiously bizarre Twin Peaks TV series. "It's easy to spend a lot of time worrying and obsessing, but meditation puts me in a blissful place," says Graham, who typically meditates for 20 minutes when she wakes up and then again in the afternoon. "At the end of the day, all that star stuff doesn't mean anything. Transcendental Meditation reminds you that it's how you feel inside that's important. If you have that, you have everything." Lynch, who also directed Eraserhead and Blue Velvet, has been sitting for 90 minutes twice a day since 1973. "I catch more ideas at deeper and deeper levels of consciousness, and they have more clarity and power," he says. Imagine the messed-up stuff Lynch might come up with if he meditated for four hours a day. Goldie Hawn, who says she has been practicing for 31 years, has a dedicated meditation room in her house filled with her favorite crystals, flowers, incense and pictures of the Dalai Lama and Mother Teresa. She meditates twice a day for at least 30 minutes. "How do you learn to witness your destructive emotions?" she asks. "You can only do this by being able to sit quietly and quiet your mind." More recent devotees are decisively noncrystal. Eileen Harrington, who runs the hard-boiled consumer-fraud group of the Federal Trade Commission in Washington, invited a meditation speaker to give a presentation after 9/11. Roughly half her staff is still at it. Bill Ford, the head of Ford Motors, meditates, as does a former chief of England's top-secret MI-5. Hillary Clinton has talked about meditating, and the Gores are converts. "We both believe in regular prayer, and we often pray together. But meditation—as distinguished from prayer—I highly recommend it," says the man who nearly became our President. Gore's TM mantra is not, as rumored, Florida. Though I don't meditate as religiously, I can see Gore's point. Taking time out of our video- and Wi-Fi-drenched lives to rediscover the present is a worthwhile activity. And I felt a tangible difference when, in my postmeditative buzz, I would walk down the street hyperaware of my surroundings, like some not particularly useful superhero power. I could even get myself to not need to go to the bathroom if I concentrated on my bladder and accepted its fullness, though I'm not really sure this is a health benefit. But if I weren't one of the few people I know who need to be more active and less chill—I could use an anger-training class—I would meditate more. And if I ever find myself faced with trauma or disease, I think I'll pursue meditation. That's what Buddhists meant it for, after all, since they believe that life inevitably entails suffering. My only counterargument is that they came up with that suffering idea before television was invented.